Nepal is a country that is rich in natural beauty and also has a very vast amount of cultural and traditional diversity. With eight of the world’s ten tallest mountains located within the boundaries of the country, Nepal is also the largest Himalayan state in Asia. The world’s tallest mountain- Mount Everest, lies on the Khumbu region of Nepal. Because of its immensely prepossessing mountainous beauty, trekking in Nepal has become the top activity to do among travelers. Thousands of trekkers and hikers visit the country every year to go through various trekking destinations at many different regions of Nepal. Nepal’s rich cultural and religious diversity also makes the country a top destination for religious tours. With many sites and settings listed on the UNESCO World Heritage Sites list, Nepal is a country that demands a visit at least once. The Himalayan landscape of the country towards the north garners many trekkers. For a small country, Nepal has tremendous geographic diversity. The beautiful terrain of the destinations also caters heavily towards tourism. One famous city for adventure activities is the lake-side city of Pokhara. Albeit Nepal trekking being the most popular and sought after activity to do, Nepal offers so many more adventures activities and thrills. The diverse topography and the encompassment of natural wonders like rivers and their tributaries as well as deep gorges and lush woodlands make Nepal a destination for thrill seekers as well as leisurely cultural tours and easy hikes. Here are top 7 things to do in Nepal. Because of Nepal’s beautiful mountain peaks, trekking in Nepal is perhaps one of the most famous activities to in the country. Some 90 of Nepal’s peaks exceed 7,000 meters and eight exceed 8,000 meters, including Mount Everest and Kanchenjunga. Regions that are quite famous for trekking also include the beautiful region of Annapurna, the Manaslu region, the Langtang region, the region of Mustang and many off-the-beaten-path trails that go through isolated and secluded acreages on remote and far-off parts of the country. The Everest region is one of the top destinations for Nepal trekking. With trekking journeys like the Everest Base Camp Trek, Annapurna Base Camp Trek the experience of trudging through dainty settlements and mountain villages and meeting and interacting with local indigenous people of the Himalaya is a great way to learn about their culture and tradition. The experience of this is very humbling and is made all the more enchanting by the views and sights of various cerulean mountain peaks that loom in the distance and form the foreground of many trekking journeys. Nepal trekking is also a great way to learn and encounter the terrain’s natural wonders and visit destinations that offer the best elements and aspects. It is a fascinating experience where the traditional aspect of the journey is molded spectacularly with the landscapes and with the mountains as well. The huge variety of options allows for people of many ages and capabilities to attempt a trek in the country. The strong culture and unreserved friendliness of the Nepalese people adds to the charm of trekking in Nepal. Hiking is great way to have break from the monotonicity of everyday life and spend some time in the luxurious lap of nature. Kathmandu, one of the most commercialized cities in Nepal, has many close vantage points and hiking trails that one can take to get away from the hustle and bustle of the crowded city. 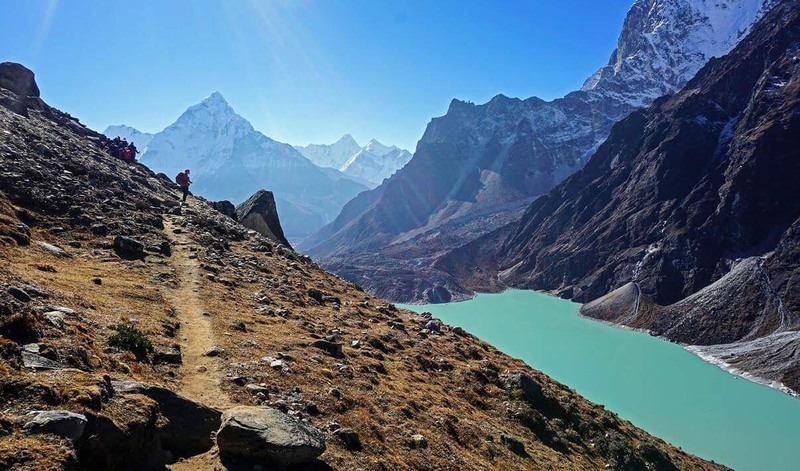 Hiking is also a great option for people who have a limited time to spend in the country and want a taste of Nepal’s original natural environment. With destinations famous for hiking like Nagarkot, Daman and Chisapani, travelers can walk along peaceful hillsides and can look at the distant mountain peaks as well as panoramic views of the valleys and cities that lie below. Hiking is definitely a leisure activity that is aimed at rejuvenating the body and refreshing the mind. It is a good sport to do every once in a while when city-life becomes overwhelming. The beautiful landscape and the emerald terrains of the hiking routes present one of the best activities to do in the country for people who want a relaxing experience in the precipice of the busy city life. Peak Climbing is definitely an adventure taken by travelers and mountaineers who want more thrills than regular trekking journeys. There are many climbable peaks in the country that offer a wonderful and thrilling experience. Peaks like Lobuche, Naya Kanga, Tharpu Chuli, the Island Peak and the Pisang Peak are some of the more famous peaks that see many climbers a year. The palpable excitement of peak climbing is enhanced by the journey as well, as the paths to the peak often includes many destinations and villages. The beautiful landscape of snowy vastness at the top of the peaks presents amazing views and mesmerizing landscapes for mountaineers to rejoice upon. Nepal is rich in culturally significant sites and settings. The art and architecture of Nepal’s temples and various places of worship are not found anywhere else on the planet. The Durbar squares of the Kathmandu Valley are excellent examples of Nepal’s architectural dexterity and intricacy. The courtyards, the chaityas and Bihars and the Gompas found in the city are opulent in their decorations and are complimented heavily with thousand-year old inscriptions and sculptures. The well-preserved painting and religious texts found on many sites makes cultural tours in the country a very enriching affair. With many sites listed under the UNESCO World Heritage Sites list, Nepal’s cultural tour is an enlightening ordeal where the country’s history is reflected marvelously on the destinations. With influences from many different countries, Nepal’s culture and its prosperity on the preservation of many age-old rituals and religious practices makes for quite an exotic experience not found anywhere else outside the country. With over thousands of rivers and tributaries that flow from the source at the Himalayas, Nepal is a country rich in water resources. Nepal is also one of the top destinations for White water rafting. With amazing jovial rivers like the Sun Koshi, the Kali Gandaki and the Trishuli among countless others, White Water Rafting in Nepal is an amazing experience that lets travelers and adventurers soak themselves in the winding and twisted rapids of ebullient white waters. Nepal has a much diversified biome scattered throughout the country. As such, the flora and fauna of Nepal is also very unique. The dramatic changes in elevation along the transect results in a variety of geographical features from tropical savannas, subtropical broadleaf and coniferous forests, montane grasslands and shrub lands and rock and ice at the highest elevations. With this feature comes the presence of a myriad of plant and animal species who have their habitat at various ecological spheres of the country. Nepal has many protected areas that have their own terrestrial ecosystems. Jungle safaris in the national parks and protected areas presents the opportunity to experience the animals in their natural habitat. Many endangered animals like the Red Panda, the Musk Deer and Snow Leopards can be seen while riding an elephant’s back in the rich woods and lush jungles of the country that range in elevations and climate. Being a widely diversified country in terms of landscape, Nepal offers many adventure sports to do as well. Activities like Bungee Jumping, Zip-flying, paragliding and rock climbing can be done at various beautiful locations throughout the country. The sports are also a great way to marinate oneself with the marvelous landscape of the place. Leisure boat rides on pristine and tranquil lakes along with fine intercontinental cuisine and exotic manifestations makes Nepal a perfect holiday destination. Hospitable people, best terrains that differ in topography and climate and the encompassment of glorious mountain peaks glad in snow makes Nepal one of the top destinations in Asia to have a visit to. There are many more things to do in the country and there is something for all age groups and demographics.